“All the Boys (Profile 1)." Photos courtesy LSUMOA. On the walls are images of obscured black faces next to police reports. There’s a video montage of police brutality. Taking up one wall, five video stills from a Chicago police car’s dash cam show the moments before and after the shooting of Laquan McDonald in 2014. In Weems’ reproduction of the video stills, finished just before the exhibition opening, you can see McDonald crumpling to the ground in the last frame. The pieces are part of “Carrie Mae Weems: The Usual Suspects,” which opened in mid-April at the museum. 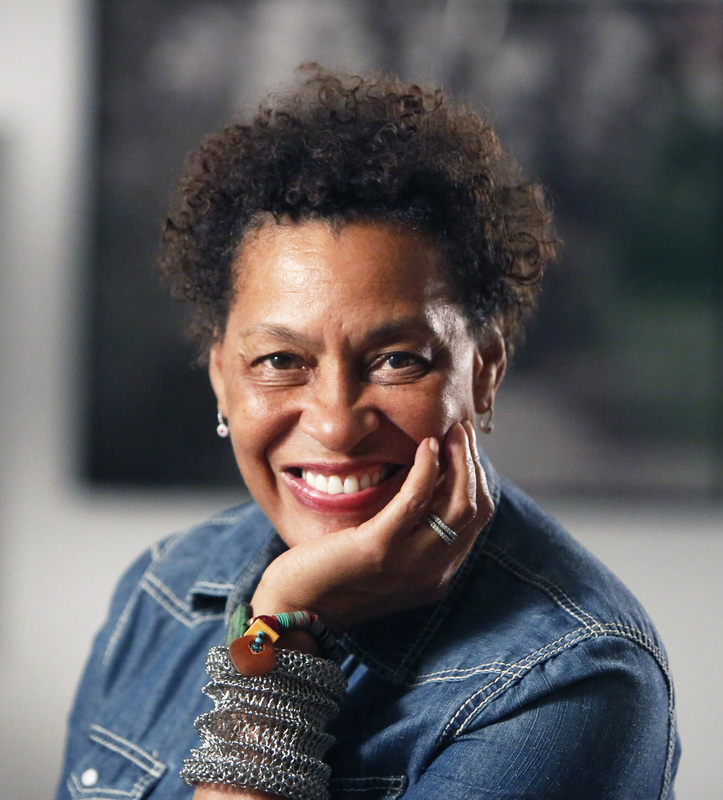 Weems is a celebrated contemporary artist, a MacArthur “Genius” grant winner, and has shown works at the Met and Guggenheim in New York. Her photographic works tend to follow themes of class, race, cultural identity and authority. These recent pieces focus on police killings, from Tamir Rice to Alton Sterling, and implicit bias against black people. Many of the images show black figures obscured in some way—either out of focus or with faces blocked by bars of color. The implication is clear: that just seeing the skin tone or the silhouette of a black man in a hoodie is enough to cause concern. It’s a difficult topic, especially since the show opened just two weeks after the Baton Rouge Police Department released raw footage of Sterling’s gruesome death and announced disciplinary action for Officer Blane Salamoni. Sterling is mentioned in one of nine text panels in the exhibit, each presenting the basic police report data of those specific shooting deaths, delivered in cold, matter-of-fact detail. The collaboration with Weems also offers a chance for the museum to reexamine its permanent collection. In January 2017, the museum hosted a “hack day” and asked the public to place Post-it notes around the galleries with comments or opinions. Some pointed out the lack of diversity in the permanent collection galleries, such as a portrait room filled with the white faces of plantation owners and regal, wealthy women. Indeed, the museum’s 1950s beginnings as the Anglo-American Art Museum on LSU’s campus celebrated British and colonial American art and artifacts. In the ’90s, the museum finally changed its name to reflect a growing and eclectic collection focused more on Louisiana and global artworks. The “hack day” coupled with a frank discussion with Dialogue on Race facilitators led museum staff to begin restructuring those galleries. “A resounding comment was that slavery was nowhere acknowledged in the ‘Art in Louisiana’ exhibition [part of the permanent collection], which was something that already stuck out to us here,” says Taylor, who joined the museum in 2016. Arrangements of antebellum pieces, which Taylor says “evoked a plantation home,” are now broken up by contemporary works on race, class and Louisiana’s cultural heritage. In 2017, when Taylor and Weems began planning “The Usual Suspects” exhibition, they looked at ways to temporarily incorporate some of her other works into the permanent collection galleries. The placement would turn Weems’ societal gaze on the museum itself. So among paintings in the landscape gallery are photographs from one of Weems’ 2003 series where she stands facing Louisiana plantations and housing projects. Among the portraits of British and American figures are two photographic prints from another Weems series, this one featuring historical images of black slaves who were part of a Harvard study in the 1800s on racial inferiority.